The workshop will commence on Monday, June 29 with the attendees registration at XXam at the hotel. You can complete the registration form here. JLESC attendees will be flying into Aeroport de Barcelona – El Prat. Transportation from the airport to the Barceló Sants Hotel is available by taxi, bus, train or rental car. Travel time from the airport to the hotel should take around 20-30 minutes, depending on traffic. 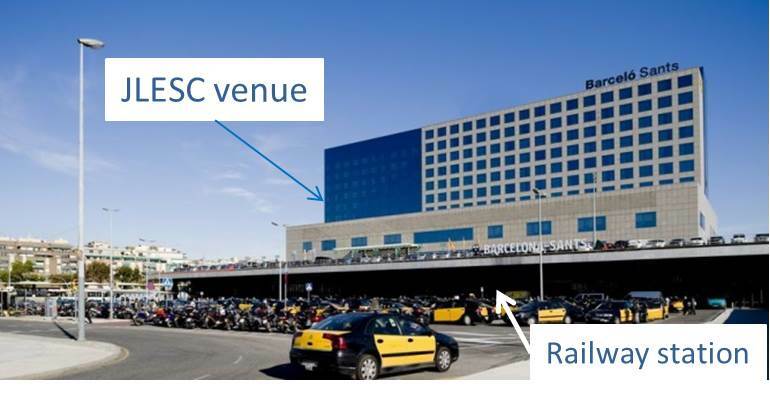 Taxis from Barcelona Airport offer their services 24 hours, waiting for passengers at the taxi ranks located on floor 0 in terminal T1, and just outside the buildings, in terminal T2: T2A, T2B and T2C.The taxi fare from the airport to hotel is around 30€. The AeroBús A1 goes from/to Terminal T1 and the AeroBús A2 goes from/to Terminal T2 to Barcelona. These buses go to the centre of Barcelona. Along the route there are stops at the most important points of the city: Pl. Catalunya, Sepúlveda-Urgell, Pl. Espanya, Gran Vía-Urgell, and Pl. Universitat.The best stop to get off at is Pl. Espanya. At the airport, the AeroBús A2 has 3 stops at terminal T2 (T2A, T2B and T2C) and the AeroBús A1 one in terminal T1. R2 line is currently the only line that arrives at the airport from Barcelona or other cities from Catalunya. The terminal T2 and the Rodalies de Catalunya train station at the airport are connected by a covered footbridge. This footbridge has a section of elevators and escalators in the nearest favoring the access to people with reduced mobility. If you arrive by train but your flight departs from the terminal T1, use the shutte bus Bustransit T1-T2 to get from one terminal to another. Stops at the terminal T2 are located opposite the intermodal building in T2B and in the T2C. The shuttle bus schedule is from 5.30 hr to 24.00 hr every 6 or 7 minutes approximately, and from of 0.00 hr to 5.30 h. every 20 or 25 minutes.This bus is free and takes about 10 minutes. The approximate duration of the journey to Barcelona Sants (the railway station with direct access to the BDEC venue) is 20 minutes and the return ticket is 8,2€. There are several hirecar companies at Barcelona Airport. Major have their car rental offices and all allow their customers to return the car at the airport. Barcelona currently has eight metro lines that can be identified by the number and colour of the line: L1 (red), L2 (lilac), L3 (green), L4 (yellow), L5 (blue), L9 (orange), L10 (light blue), L11 (light green) and serve most of the city. The metro operates an integrated fare system enabling passengers to obtain a free transfer from one means of public transport to another within a period of 1 hour and 15 minutes. There are different types of travel cards and transport passes in Barcelona that are valid throughout the public transport network (metro, buses, tram and suburban rail), including the T-10 card which is valid for 10 journeys (9,95€), or day passes (2, 3, 4 and 5 days).